The author of this volume, Irish clergyman Jonathan Smedley (1671-1729), had a long-running ‘beef’ with Jonathan Swift (1667-1745) and Alexander Pope (1688-1744). Smedley’s invective against the pair, Gulliveriana, contains a frontispiece that depicts them in an unfavourable light. This foreshadows their treatment in the text. On the left stands Swift, dressed in his robes of office as a clergyman, a cloven hoof peeking out at the bottom. Pope is on the right, a short man standing on a table, with the pronounced hunchback he had developed after a childhood illness. As part of the ‘joke’, it appears as though ‘Veritas’ (Truth) has designed the image, and ‘Justitia’ (Justice) has engraved it. 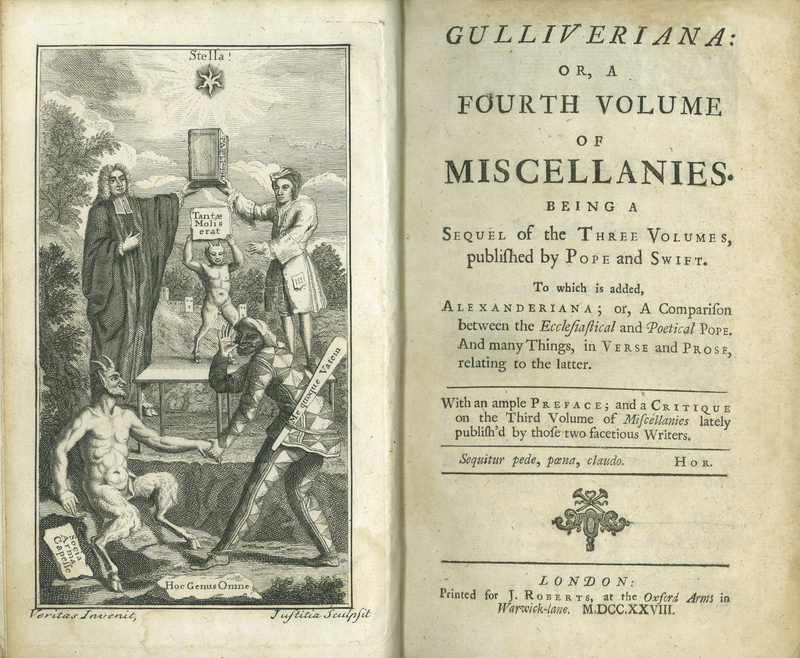 [Jonathan Smedley], “Gulliveriana: Or, A Fourth Volume of Miscellanies,” ourheritage.ac.nz | OUR Heritage, accessed April 26, 2019, http://ourheritage.ac.nz/items/show/10712.